The village of Alberobello sprouts up on a wide relief cut in two by a depression produced by the action of an ancient water course. The surrounding landscape, rich in olive groves, vineyards and cherry orchards, offers carsic dolinas and terraced lands whose genesis is bend to tectonic phenomena. In the old village there are a hundred trulli some 5 centuries old. 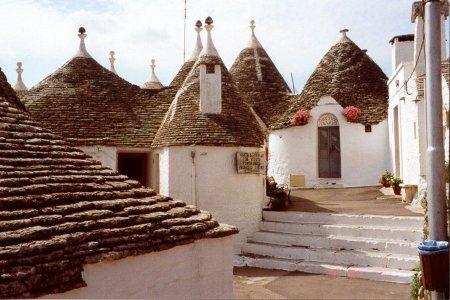 The trulli are remarkable examples of drywall (mortarless) construction, a prehistoric building technique still in use in this region. The trulli are made of roughly worked limestone boulders collected from neighbouring fields. These gleaming habitations (whitewashed each year) are curious, rounded structures with cone-shaped, grey stone roofs.